Tippecanoe County was formed March 1, 1826, and named for the anglicization of "Kethtippecanoogi", a Miami people term meaning "place of the succor fish people." (Kriebel, Robert C. - Tippecanoe at 2000: A Hoosier County Recalls Its Past). 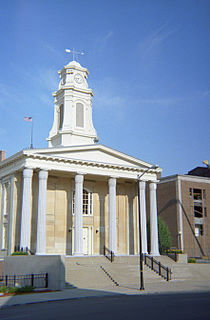 The county is best known for Purdue University, the 1811 Battle of Tippecanoe, and the Tippecanoe County Courthouse, a structure built in 1881 and included in the National Register of Historic Places. Tippecanoe County is part of the Lafayette, Indiana, Metropolitan Statistical Area. The history of Tippecanoe County spans six distinct political and cultural periods: Native American lands from at least 8000BC, including the Mississippian culture, French occupation (part of New France beginning in 1670's), British occupation starting in 1763, part of the United States Northwest Territory in 1787, part of Indiana Territory in 1800, and finally part of the State of Indiana in 1816. The political organization of the county began in 1826 by act of the Indiana Legislature. The first European explorers arrived in the 1670's and the first permanent settlement was Fort Ouiatenon by the French established in 1717. Lafayette was platted in 1825 and Purdue University founded in 1869. According to the 2010 census, the county has a total area of 503.24 square miles (1,303.4 km2), of which 499.81 square miles (1,294.5 km2) (or 99.32%) is land and 3.44 square miles (8.9 km2) (or 0.68%) is water. A freight train approaches the town of South Raub on the border of Randolph and Wea Townships. In recent years, temperatures in Lafayette have ranged from an average low of 17 °F (−8 °C) in January to a high of 86 °F (30 °C) in July, although a record low of −23 °F (−31 °C) was recorded in January 1985 and a record high of 105 °F (41 °C) was recorded in June 1988. Average monthly precipitation ranged from 1.58 inches (40 mm) inches in February to 4.24 inches (108 mm) inches in June. Three different railroad lines intersect in Tippecanoe County, all running through the Lafayette area. CSX Transportation operates a north-south line; Norfolk Southern Railway operates a southwest-to-northeast line, and the Kankakee, Beaverville and Southern Railroad operates a daily-service line running from the northwest to the southeast. The county contains one public-use airport: Purdue University Airport (LAF) in West Lafayette, Indiana. County Council: The county council is the fiscal branch of the county government and controls all the spending and revenue collection in the county. The county council and the board of commissioners share legislative authority. Representatives are elected from county districts. The council members serve four-year terms. They are responsible for setting salaries, the annual budget, and special spending. The council also has limited authority to impose local taxes, in the form of an income and property tax that is subject to state level approval, excise taxes, and service taxes. In the 2008 Democratic primary, Tippecanoe County was one of 10 (out of 92) Indiana counties to give the majority of its votes to Barack Obama. In the 2008 Presidential election, Tippecanoe County was one of 15 Indiana counties to give the majority of its votes to Obama/Biden. Thanks to the sizable support of Purdue University students, Tippecanoe County played a pivotal role in Barack Obama's upset win in Indiana (49.9%-49.0%; 1,367,264 votes to 1,341,101 votes) by supporting the Democrat ticket of Barack Obama/Joe Biden 55.1%-43.5% over the Republican ticket of John McCain/Sarah Palin. As of the 2010 United States Census, there were 172,780 people, 65,532 households, and 37,003 families residing in the county. The population density was 345.7 inhabitants per square mile (133.5/km2). There were 71,096 housing units at an average density of 142.2 per square mile (54.9/km2). The racial makeup of the county was 84.0% white, 6.2% Asian, 4.0% black or African American, 0.3% American Indian, 3.3% from other races, and 2.2% from two or more races. Those of Hispanic or Latino origin made up 7.5% of the population. In terms of ancestry, 27.5% were German, 13.9% were Irish, 10.8% were English, and 6.1% were American. Of the 65,532 households, 28.5% had children under the age of 18 living with them, 42.4% were married couples living together, 9.8% had a female householder with no husband present, 43.5% were non-families, and 29.2% of all households were made up of individuals. The average household size was 2.42 and the average family size was 3.02. The median age was 27.7 years. The median income for a household in the county was $47,697 and the median income for a family was $60,367. Males had a median income of $45,018 versus $31,995 for females. The per capita income for the county was $22,203. About 10.3% of families and 20.0% of the population were below the poverty line, including 18.2% of those under age 18 and 5.0% of those age 65 or over. Public schools in rural/suburban Tippecanoe County are administered by the Tippecanoe School Corporation, while those in the cities are under either the Lafayette School Corporation or West Lafayette Community School Corporation. Purdue and Ivy Tech each have campuses at other sites in Indiana. Much of the economy of Tippecanoe County is centered in its two largest communities: Lafayette and West Lafayette. Purdue University is by far the largest employer in the county, but private industry and commerce independent of the university also employ many others. Major employers include Subaru-Indiana Automotive, Wabash National, Caterpillar, Fairfield Manufacturing, Franciscan St. Elizabeth Health, Alcoa, State Farm, and IUHealth Arnett. ^ a b "State & County QuickFacts". United States Census Bureau. Retrieved July 10, 2014. ^ a b "Monthly Averages for Lafayette, Indiana". The Weather Channel. Retrieved 2011-01-27. ^ "Indiana Railroads" (PDF). Indiana Department of Transportation. 2008. Archived from the original (PDF) on 2009-11-18. Retrieved 2010-12-11. ^ "Guide to Indiana County Government" (PDF). Association of Indiana Counties. Retrieved October 27, 2016. ^ "Election Center 2008: Primary Results - Elections & Politics news from CNN.com". CNN. Retrieved May 25, 2010. ^ "2008 presidential election results". ^ Leip, David. "Dave Leip's Atlas of U.S. Presidential Elections". uselectionatlas.org. Retrieved 2018-05-20. ^ "QuickFacts. Tippecanoe County, Indiana". United States Census Bureau. Retrieved November 7, 2018. ^ "Home - Tippecanoe County Public Library". tcpl.lib.in.us. Retrieved 2018-04-29. ^ "West Lafayette Public Library - Home". wlaf.lib.in.us. Retrieved 2018-04-29. General R. P. DeHart, ed. (1909). Past and Present of Tippecanoe County Indiana. 1. Indianapolis: B. F. Bowen and Company. Retrieved 2010-12-11. General R. P. DeHart, ed. (1909). Past and Present of Tippecanoe County Indiana. 2. Indianapolis: B. F. Bowen and Company. Retrieved 2010-12-11. White County is a county located in the U.S. state of Indiana. As of the 2010 census, the population was 24,643. The county seat is Monticello. Sullivan County is a county in the U.S. state of Indiana, and determined by the U.S. Census Bureau to include the mean center of U.S. population in 1940. As of 2010, the population was 21,475. The county seat is Sullivan. St. Joseph County, commonly called St. Joe County by locals, is a county located in the U.S. state of Indiana. As of Census 2010, the population was 266,931, making it the fifth-most populous county in Indiana. Formed in 1830, it was named for the St. Joseph River which flows through it toward Lake Michigan. The county seat is South Bend. Pulaski County is a county located in the U.S. state of Indiana. According to the 2010 U.S. census, the population was 13,402. The county seat is Winamac. Owen County is a county located in the U.S. state of Indiana, and determined by the U.S. Census Bureau to include the mean center of U.S. population in 1920. As of 2010, the population was 21,575. The county seat is Spencer. Kosciusko County is a county located in the U.S. state of Indiana. Census 2010 recorded the population at 77,358. The county seat is Warsaw. Fulton County is a county located in the U.S. state of Indiana. As of 2010, the population was 20,836. The county seat is Rochester. Carroll County is a county located in the U.S. state of Indiana. As of 2010, the population was 20,155. The county seat is Delphi. Battle Ground is a town in Tippecanoe Township, Tippecanoe County in the U.S. state of Indiana. The population was 1,334 at the 2010 census. It is near the site of the Battle of Tippecanoe. Lafayette is a city in and the county seat of Tippecanoe County, Indiana, United States, located 63 miles (101 km) northwest of Indianapolis and 105 miles (169 km) southeast of Chicago. West Lafayette, on the other side of the Wabash River, is home to Purdue University, which contributes significantly to both communities. Together, Lafayette and West Lafayette form the core of the Lafayette, Indiana Metropolitan Statistical Area. According to the 2010 United States Census, the population of Lafayette was 67,140, roughly a 19% increase from 56,397 in 2000. Meanwhile, the 2010 U.S. Census pegged the year-round population of West Lafayette at 29,596 and the Tippecanoe County population at 172,780. West Lafayette is a city in Wabash Township, Tippecanoe County, Indiana, United States, about 65 miles (105 km) northwest of the state capital of Indianapolis and 103 miles (166 km) southeast of Chicago. West Lafayette is directly across the Wabash River from its sister city, Lafayette. As of the 2016 census estimate, its population was 45,872. It is the most densely populated city in Indiana and is home to Purdue University. Jefferson High School is a high school located in Lafayette, Indiana and administered by the Lafayette School Corporation. Its mascot is the Broncho and its school colors are red and black. McCutcheon High School is located in Lafayette, Indiana, located on Old 231 South. The school was established in 1972 with the merger of Wainwright and Southwestern high schools and is named after John T. McCutcheon, who was a political cartoonist and Tippecanoe County native. It has been active in the North Central Conference since 2014. Wabash Township is one of thirteen townships in Tippecanoe County, Indiana, United States. As of the 2010 census, its population was 59,279 and it contained 21,448 housing units making it the most populous township in Tippecanoe County. Buck Creek is an unincorporated census-designated place in Washington Township, Tippecanoe County, in the U.S. state of Indiana. West Point is an unincorporated community and census-designated place in Wayne Township, Tippecanoe County, in the U.S. state of Indiana. The population was 594 at the 2010 census. The Hoosier Crossroads Conference is a member conference of the Indiana High School Athletic Association. Teams first competed in the conference in the 2000-2001 school year. The HCC contains eight high schools in the Indianapolis Metropolitan Area. There are two schools in Hendricks County, one in Boone County, four in Hamilton County, and one in Marion County.